↑ 1.0 1.1 1.2 1.3 1.4 1.5 1.6 1.7 "Mercury Fact Sheet". NASA Goddard Space Flight Center. 2007年11月30號. 喺2008年5月28號搵到. ↑ 3.0 3.1 Vasavada, Ashwin R.; Paige, David A.; Wood, Stephen E. (1999年2月19號). 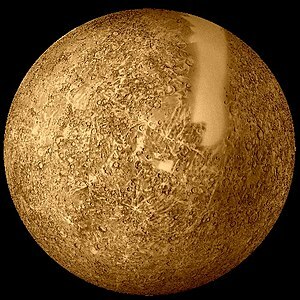 "Near-Surface Temperatures on Mercury and the Moon and the Stability of Polar Ice Deposits" (PDF). Icarus. 141 (2): 179–193. Bibcode:1999Icar..141..179V. doi:10.1006/icar.1999.6175. Figure 3 with the "TWO model"; Figure 5 for pole.